Demand for Myanmar’s industrial zones beyond Yangon is bound to grow but poor transport and energy infrastructure have held back investments, a major study suggests. Work on establishing an economic cooperation zone along the China-Myanmar border has reportedly started, with priority given to sectors including manufacturing. Amid some concerns about Chinese presence in Myanmar, the project is likely to be a good starting point in maintaining stability in the border area. The government collected more tax revenue than expected during the six-month interim period between April and September last year, U Maung Maung Win, deputy minister for the Ministry of Planning and Finance (MOPF) explained during a Union Hluttaw session on January 21. The upcoming Rakhine State Investment Fair-2019, scheduled for Feb. 21-23 at Ngapali Beach in Thandwe, Myanmar’s Rakhine state, will offer high hope of realizing full growth potential, observers said here on Wednesday. Myanmar received over 3.55 million foreign tourists last year, a 3.15 percent increase over the 3.44 million in 2017, according to the Ministry of Hotels and Tourism. In the dusty Myanmar border town of Shwe Koko, ethnic Karen shop owner Saw Tu wipes the dust off a bag of red chili peppers as he prepares for another day of business at the local market. Thai national oil company PTT Exploration and Production (PTTEP) is expecting to spend a total of US$3.3 billion in 2019 to continue its activities in at the Zawtika gas field in theGulf of Moattama, Myanmar. Nearly four dozen migrant workers from Myanmar’s Sagaing region returned home Wednesday after fleeing from a sugar plantation across the border in southwest China’s Yunnan province, where they said they were cheated out of wages by their employer and forced to endure miserable living conditions. Beijing-based CITIC Construction, subsidiary of CITIC Group and Myanmar’s Myanmar Agribusiness Public Corporation (MAPCO) will invest up to $500 million into establishing high-end rice mills and agri-business service centers across the country, a top executive of MAPCO said. The Amyotha Hluttaw (Upper House) intends to keep Myanmar’s marrying age at 18 as part of the Child Rights Bill, which it is now deliberating. CCI France Myanmar has just released online their second Myanmar Salary Survey, according to a press release. The Yangon City Development Committee, the municipal body, has invited expressions of interest from private companies to introduce a smart parking system in the busy downtown area. The Myanmar government will establish a coast guard force to safeguard its 2,080-km-long coastline and territorial waters, Xinhua reported. A land ownership dispute in Dagon Seikkan Township has upset a local NGO’s efforts to provide housing for low-income families, and divided a community. About 300 workers went on a 24-hour strike at the CMF Myanmar Factory 2 in Hlaing Tharyar township, Yangon, after it was closed in violation of labour laws, the workers said on Tuesday. A delegation led by Ms. Christine Schraner Burgener, UN Secretary-General’s Special Envoy on Myanmar arrived in Sittwe of Rakhine State on January 22 where she held meetings with the Rakhine State government and officials of Rakhine State parliament. Myanmar’s first international car show is underway in Yangon. It comes in response to booming demand for new vehicles in a nation that has, until now, relied on used imports from abroad. The Myanmar Army has recently established four new bases in areas of Kayah State where Karenni rebel groups remain active, evoking fear among locals that fresh clashes may break out in the area. Myanmar operator MPT has announced it will sponsor ‘The Voice Myanmar’ TV singing competition. To be broadcast on MRTV – 4, the competition will run from 24 February to 16 June. More than 60,000 people in Myanmar die annually from diseases such as cancer, heart attack, hypertension and respiratory problems resulting from tobacco use, said Yangon mayor Maung Maung Soe. Myanmar operator MPT, in partnership with the Myanmar Computer Federation (MCF), has launched the Myanmar Youth Technopreneurship Development Program 2019. In Myanmar, international development continues in former conflict areas while more than 100,000 refugees and IDPs remain without a home. Steve Sandford looks at the challenges in one community in Karen state, where Chinese companies are building a resort town. There were a total of 17,451 traffic accidents nationwide in 2018, resulting in 5,184 deaths and 26,741 injuries, according to Myanmar Traffic Police Force. Foreign Secretary M Shahidul Haque has said that the recent internal turmoil in northern Rakhine state of Myanmar is exacerbating the prolonged Rohingya crisis, and has sought US support in resolving the situation. Four Myanmar workers were killed and 12 others injured when a pickup truck transporting them overturned on a road in Chumphon province on Tuesday night. 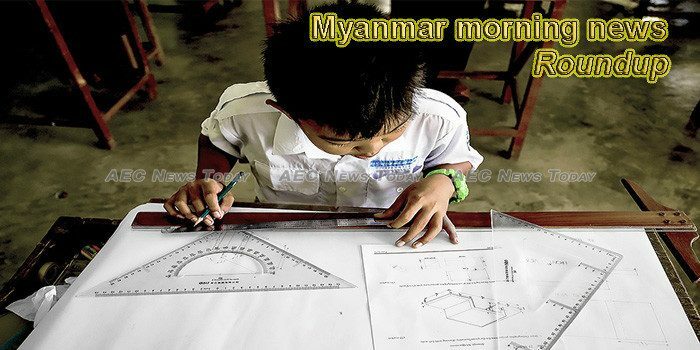 This week’s Myanmar morning news photo features acknowledges International Day of Education, January 24.